I'd been eyeing the Wet n Wild Tough Girl display at one of the local Wegmans for a while, casting longing glances at ATTEN Hut!, but not buying it because of the price tag. I really like Wet n Wild, but $4 is just too much. I rarely pay that much per bottle for anything. I'd seen the display come and go and written off ever owning anything from it...until suddenly there it was at a CVS I check every few weeks. On sale too! All Wet n Wild is 40% off there this week. At $2.50, it was still a bit more than I like to pay, but I had coupons and I'd been doing so much glancing at it. I kinda had to buy it. ATTEN Hut! 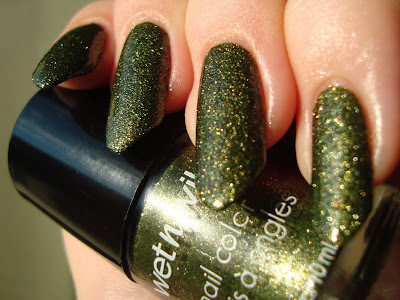 is an army green textured polish with gold shimmer. I'm...well...I'm not sure if I like it. The brush started my misgivings. There's a photo of it down at the bottom. It needs to be seen to be believed. Two coats still went on fairly easily, in spite of this monstrously awful brush. The texture is fine, but rough. It's about as rough as the Zoya Pixie Dusts, but with smaller grit. I know what Wet n Wild was going for. This is the Year Of The Texture and military-style stuff is very trendy this season, but...I'm seeing algae more than army here in the end result. It's...interesting. It gets all sparkly in bright light, but looks more mossy in softer light. I can see this being perfect for all kinds of Halloween costumes. Witch, evil mermaid, zombie, entwife, some kind of living rock... There's something murky, swampy, or undergrowthy about it. Top coating it only adds to that effect. It looks like an algal mat at the bottom of a shallow pond in the sunlight. Again, when the shimmer is subdued it looks mossy. I managed to apply it with that thing, somehow. Dreadful, isn't it? It's not the wonkiest one I've ever gotten, but it's in the top five. 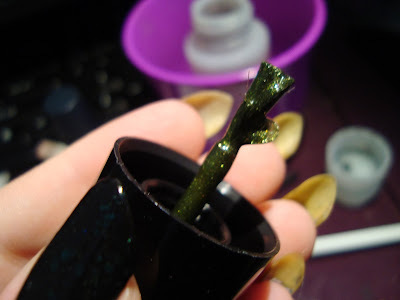 Still better than the Be Jeweled brushes though, even all screwed up like this. No poem this time. I might try the hot water trick to see if it really can cure the wonk. Bottom line: I'm lukewarm on this one. I don't love or hate it. I like weird greens, no matter what Nichole thinks or says about them, but a weird green that's also textured? It might just be too much for me. Still, it's good (aside from the brush) and very funky and unique. Whether it's funky or funky, that's your call. So...and I feel like I've asked this pretty often lately...what do you think? 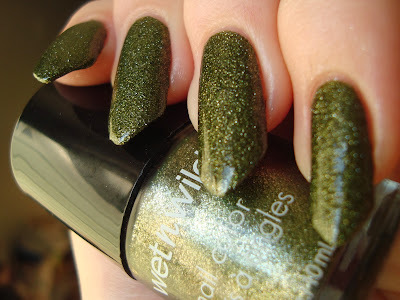 I love,love,love this color....but murky, swampy greens are my thing. That said, I HATE the brush and I hate the fat caps on those stupid bottles. Ofc I snatched it up when it was 3.99 bcs I have the patience of a 2 year old, but I also had no clue how long it might be around. I also got the purple which I returned after seeing swatches. I dunno how often I will wear the green given the brush situation, but it really is a pretty color to me. I'm still not sure. lol I think I'll let Zeus try it and if he likes it as much as he thinks he will, he can have it. Maybe. I think I saw them there too. I hope you do find them at CVS this week. It's a great sale! 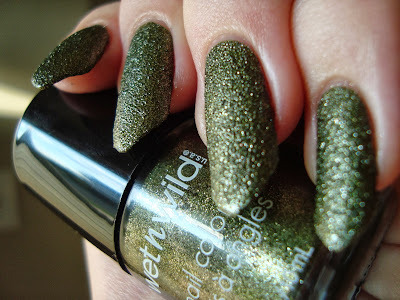 That polish would be great for mossy/mildewed zombie nails! Manufacturing errors are annoying for sure, but if you wipe all the polish off a wonked brush then use fine tipped mani scissors to snip those wayward bristles, they won't bug you anymore. I've done that before, but this was still semi-useable. Soft too, so dunno how easy it would be to wipe down.